Having a baby is a wonderful, miraculous thing, but after a while, it can start to get quite lonely. Sleep deprivation, combined with the demanding needs of baby, can prevent you from having much in the way of a social life. One way to rectify this is to organize baby play dates. They’re great for getting together with your other mom friends, as well as to make new friends. However, the thought of hosting your own baby play dates can be more than a little daunting! 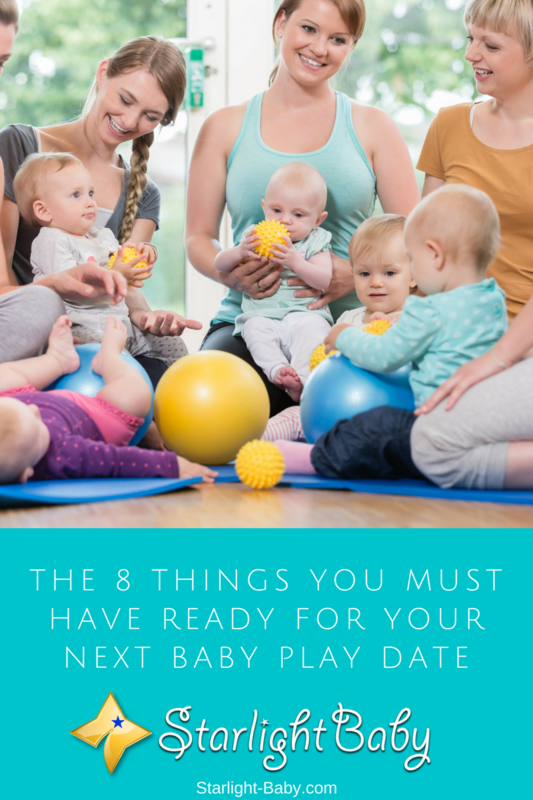 So, to make it a little easier, below you’ll discover the top things to have ready for baby play dates. Sure, you don’t want to encourage too much snacking, but if the babies are old enough to snack on solid foods, you’ll want to ensure you have plenty available. Snacks can act as a prevention tool to ward off potential melt downs. If the play date is scheduled before or some time after a feed, baby could become fussy if they get hungry. Of course, you’ll score a few brownie points if you provide snacks for the other parents too. Being hungry is no joke – especially for tired, stressed out parents! So, make sure there’s plenty of snacks to go around. Are the babies attending the play date all the same age? If not, you’ll want to make sure you have appropriate age toys available. It’s good to remember not to provide too many toys however. This is because it can actually be a little overwhelming to the babies if there’s too many toys around. It’s good to provide a couple of larger toys, along with a few smaller ones. Things like play gyms tend to be particularly popular so if you don’t already have one, it could be worth investing in one if you’ll be hosting regular play dates. While play dates can sound fun in theory, there may be times it feels a little awkward. One thing that’s guaranteed to break any awkward silences, is music. Not only will the right music help to relax the parents, but it’s also super-fun for babies too. Even babies who aren’t old enough to dance along, will appreciate the music. So, why not create a baby play date playlist? It can consist of Disney songs or if you think that will drive you insane, just a collection of pop songs could work. You could even host a sing-along if you’re confident enough. Just be aware not all of the parents will necessarily want to sing with you! Generally speaking, the majority of parents carry around additional wipes and diapers. However, you’ll also know there’s times baby brain can kick in, making it easy to forget even the basics. So, make sure you’ve got plenty of additional wipes and diapers available in case anyone needs them. Now, you don’t need to stock up on all size of diapers just in case! However, having a few extra diapers that you use for your own baby is recommended. They may not fit other babies perfectly, but they will certainly do until the parents get back home. It’s even a great idea to set up a dedicated baby changing station with additional wipes and diapers included. This will prevent other parents from the embarrassment of having to ask for extra wipes or diapers if they need them. Coffee Or Mocktails – A Must For Parents! As well as snacks, you’ll want to make sure you’ve got plenty of refreshments too. Coffee can prove invaluable for sleep deprived parents, but it’s important to remember not everyone will be able to drink coffee. If other moms are breastfeeding, they may not be able to take advantage of that much-needed caffeine boost. So, it’s good to provide an alternative. One refreshment that’s guaranteed to impress and add a little fun to the play date, is mocktails. They’re alcohol free, delicious and provide a great talking point. They’re usually pretty simple to make and you’ll find hundreds of recipes online. Something which works just as well as music for settling fussy babies, is reading. So, make sure you’ve got plenty of baby books handy. You can either host a combined story time, or let the other parents read to their babies separately. The latter does kind of defeat the object of a playdate however, so why not opt for audio books? That way, the babies can all sit in a small circle surrounding you, and you can play the audio book to keep them entertained. We’ve already given you some entertainment ideas, but it’s a good idea to create a list prior to the playdate. Having a good idea of what you’re going to be doing is highly recommended. You could host a photo shoot for example. All you’ll need is a suitable backdrop, some adorable baby costumes and a camera. If you don’t have many costumes, don’t be afraid to ask the parents to bring one along. A photo shoot is a great, fun idea which everyone is sure to love. However, it’s a good tip to do the shoot pretty early on as if you leave it until later in the play date, the babies may be a little grumpy! Similar to the additional diapers and wipes, it always helps to have some spare blankets ready. It’s easy to forget something when you’re a busy parent, so having some extra blankets on hand could prove invaluable to anyone who forgets theirs. The extra blankets could also be used for the babies to play on, or to grab and use if one of the babies needs a feed. It’s a small detail, but it can help the other parents feel more welcome. The above are the top things to have ready for baby play dates. It can be daunting, but as long as you’re well-prepared and you have the above items, you’ll find they can actually be quite fun. Have you hosted your own play dates? How did it go and what tips would you give to other parents? Let us know below! When it comes to parenting, most of the reading materials and support groups are primarily meant for mother. father’s role is always undermined in parenting. They say the moms need to form a community with other moms, but it is not heard anything on this line regarding a father. As a parent of a 9 months old baby, these tips will surely come handy when we take the baby to outdoors and join other parents. Thank you for pointing that out, vinaya. Yes, I would agree with you on that. There is a lack of focus on the roles played by dads in parenting. Much focus is on moms, but dads are now participating more actively in child-rearing. There should be more articles on dads, too. Snacks is one major thing a parent mustn’t overlook when making arrangements for their baby’s play time because kids hunger is very difficult to adults. They certainly cannot endure as adults would when they are hungry. So the snacks serves as a saviour for the parents once the kids hungry initiates. Toys too are good because it’s what intensifies their playing. While I was a kid, I had fun listening to music and the way I danced then always make my parents happy and that’s the reason I would have to say that you’ve got a point by saying that music instruments are essential when we talk of having a baby play. Also, parents should try to give their kids snacks for it will make it a good experience as well. Having the toys around is as important as anything for I have come to notice that most kids enjoys playing with their toys as well. Being a mother of a two year old can relate very well ,that hit home getting tips like this helps a lot especially for first time mums. My baby is yet to start play dates i don’t have friends but since he about to join preschool soon am sure he will make friends and will keep all those tips in mind. It’s true that your son will make friends at school, but one thing that you really have to understand is that you can also be that friend and get a plan that can enable you be close to him as well. Being your kid’s friend is necessary and good. When it comes to parenting.its not soo easy,many things to be focus,and you need to keep an eye of your baby’s. And its true. that snacks for baby’s is one of the major things parent’s must have. Because baby’s nowadays mostly attrac.In food’s. I think that when it comes to all the topics covered in this article you covered all your bases VERY WELL. I wanted to make a quick comment on the music. I have always listened to country music. So when I was pregnant I would turn on the radio and put the headphones on both sides of my belly(and yes;the baby definitely became more active). When my son was born music worked like a charm to calm him down when he was upset. Music is both therapeutic and a lot of fun for everyone…..not just for our tiny bundles of joy! I wish they had all this play date stuff, when my son was little. All his playing was with me. keep me up long nights. He always wanted my attention. I love this idea. With all the things they say you should have for a play date is pretty cool. I love it. This is awesome and sounds like a lot of fun for the child. Wipes and diapers is a major thing that a parent mustn’t overlook when making arrangement for their baby’s play time because they won’t feel comfortable when dirty. Indeed , play date is very important to babies , as it helps them to interact freely with others . I loved the eight tips mentioned in this article , they are very crucial but there is a missing tip . Which is making sure that the environment in which the play date takes place is safe and doesn’t shape any kind of danger . This is a very useful blog for parents and people have newborns.Among parents this is especially for mothers,because they are the ones taking care of baby and for fathers they would be out for work or something like that. Very helpful article.I agree with you completely. But seriously some children need some sort of Daddy’s time . Fathers play some key roles in making a baby feel at home. And it’s best to have such thing ready before a baby is born. I think the baby checklist you’ve stated up there is exceptional before an arrival of a baby. When it comes to parenting as long you are well informed beside the appropriate great love for the baby,it could be fun and joy raising the kid(baby)! Daddy’s attention is needed too. So that i suggest. That put a daddy’s time with baby’s daily routine. So that baby’s will.not be afried whe he/she .meet ther dady’s.. I love this article for so many reasons. The idea of having your baby around other babies helps them connect in a way we can’t begin to understand. I’ve seen this happen. I know for a fact that the music and reading help in developing babies’ cognitive abilities, so these are a must do for the play dates. And of course the refreshment! A serious necessity that shouldn’t be overlooked. I’m not a mother yet, but I’ll be taking tips from here to apply when the time comes. it is really hard to be a mom in deed ! but when you see the smile on your baby”s face you will forget all of the fatigue hours you spend on preparing his play date . do not forget to bring the stroller also it is a big help .